I must admit, Louisville is my hometown, it was where I spent the first 18 years of my life, but this route makes you become a tourist in the most positive way. I found myself looking up at the KFC Yum Center, then as I was heading uphill passing the Muhammad Ali Center, I saw the Mile 1 marker and heard a WONDERFUL song playing, "World's Greatest" by R.Kelly from the "Ali" soundtrack. Now, if you have lived in Louisville for one year, or 70 years, or just visiting, you know the legacy of Ali. I got teary eyed. It was a pure, awe-inspiring moment that touched me. So KUDOS to JamActive for making us runners feel like Rockstars!! Along the route, there were cheerleaders and bands from different high schools (mind you, 30 degrees!! ), and the Dancers and Cheerleaders from University of Louisville to cheer you on, not to mention the countless people out cheering us on, made the run simply amazing! Now, I wore my Superman shirt that I save for long, special races. It not only has the handprints of Ayanna and Annabelle, but I added the footprints of Adrianna. 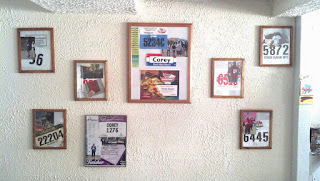 The racing bibs had our names on it, so all along the way, I was treated to hearing "GO COREY!" or "GREAT JOB, SUPERMAN!" I must admit, I am a sucker for that. I kept good pace, and as each mile passed, I kept telling myself, to just enjoy the moment. Around mile 9, I started to feel a twinge of a cramp coming in my calves and had PAINFUL memory flashbacks to Derby Marathon. But another good friend of mine had suggest some electrolyte pills, and I knew it was time to take them, and kept running. I was most proud because of the overpass leading to and away from Papa John's Cardinal Stadium is a HUGE hill that we would go on twice, and I never walked it at all. I kept chugging along. I also ran the whole race. As I was hitting 12.86 miles, a Godsend of a friend started cheering me on. She ran the relay for this and was done and waited to cheer for me. She ran with me, up until it was time for me to enter Slugger Field. All the while shouting encouragement. This was an AMAZINGLY unselfish thing (and I was DRAGGING at this point). I am in debt to her forever for that. Thank you Lesli. 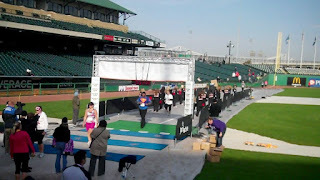 Well, now I see I am entering Louisville Slugger Field an the Center Field warning track and I can see the Finish Line. I see they had the Dance Team from U of L cheering us on, right before we cross at Home Plate. I did it...I immediately heard the most WONDERFUL sounds, and it was my family and friends cheering for me. I looked up above the 3rd base dugout to see them, and instead of feeling pride in myself, I felt blessed and grateful for having some extraordinary people in my life (Runners: Rebecca Jo, Rob, Amy, Matt, Lesli; my unselfish wife, Damary, and our daughters) who I could DIRECTLY pinpoint their showing of love that helped me cross this finish line. I wore my medal to work (I work 3rd shift as a Registration Rep in an ER...so yes, I haven't been to sleep since the night before the race (today is Tuesday), because I worked Sunday and Monday night. 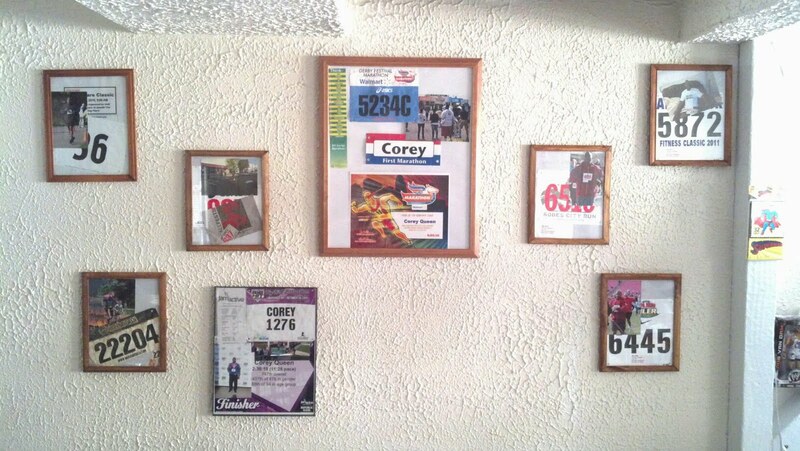 I also added the paraphernalia to my Wall of Running. But that is about as much celebrating I will do. I line up to do the Louisville Sports Commission (LSC) Half Marathon on the 12th. I RELISH this challenge. It all feels full circle. I discovered these races during the course of running the Kentucky Derby Marathon this past April. It is surreal on the most wonderful level.